Most of you who know me (except for perhaps the very few who met me in elementary school) know that I’ve always been fat. “Big,” “heavy,” “large”—these are some of the euphemisms I’ve grown up with. I never noticed my weight until junior high school. Until that point, I was just a big kid, and this was an advantage when I tried out for Little League baseball or play football. In junior high, however, we had to “suit up” for PE, aka gym class. The first day of class, we had to go to the locker room, take off all our clothes, and put on the supplied jockstraps and gray woolen gym shorts. For the first time in my life, someone pointed at the little rolls of fat around by belly and laughed. Until that second, I had no idea that I was anything other than a perfectly normal kid. Disclaimer: this is not medical advice, and I’m not advocating for any particular lifestyle, exercise, or medical treatment. I’m merely sharing my story in the hope that it’s either interesting or useful for others. When I went off to college, I bought a tuxedo (required for orchestra members) with size 44” pants. I wore that tux numerous times for performances as well as other formal events over the next four years. By the end of school, however, it was getting tight. While in college, I took the required four PE classes; for me, these included two semesters of cycling and another two of sailing. I went on long rides with other cyclists at Baylor, and even had a rather spectacular crash when I hit a small patch of water at the bottom of a very steep hill in Waco’s Cameron Park. I had no broken bones, but I managed to scrape most of the skin off my entire right side, from the legs to the hips to the shoulder and even on my face. It was a spectacular-looking injury, but no major damage was done. When I left college to go to work in Austin, I sold my bicycle since I had moved to a house farther from campus and riding was not easy to keep up (and probably my as-yet-undiagnosed ADHD meant that I had new interests). In Austin, I lived in suburban apartments and commuted by car to work. I had no concept, even then, of deliberate physical activity. That is, it never actually crossed my mind that I had to do something to be healthy. Fitness was something that just happened when I was doing things that I enjoyed. But photography and playing the guitar do not consume as many calories as riding a bicycle or hiking, and my weight was slowly creeping up, unknown to me, fueled by a steady diet of pizza, fajitas, and the best BBQ around. In 1996, I moved to England. I was still a “big guy,” but my weight was not out of control. Living and working in England (and much of Europe and South Africa) involved a lot of walking: you walked from the train station to the office, from the office to the pub, and so forth. So, again, of necessity, I was getting exercise without needing to think about it. I took up golf, too, and that was probably a healthy change. In 2000, I left my job in the UK and returned to the USA: Silicon Valley, at the height of the boom. I went to work for a startup; this involved commuting (by car), and walking across the parking lot for those calorie-laden foods that I’d been missing in my four years overseas. In my first eight months back in the USA, my weight zoomed up 65 lbs. I only know this because I weighed in at the doctor and thought to myself, “Hmmm, that’s a bit more than I remember from last time.” I didn’t, however, think much more about it. My time with a startup was followed by several years of near-total unemployment. When you’re unemployed, golf is not something you spend money on. Unbeknownst to me, my weight was slowly climbing. Several jobs later, I found myself with a bad back, sore knees, arthritis, and a profound tendency to breath deeply if I had to walk a slight upwards slope. Because of the back pain, I avoided walking. When I moved back to Texas to take a new job in 2010, I weighed about 420lbs (which I jokingly referred to as “a fifth of a ton”) and wore size 62” pants. When we moved to Texas, we got a new, larger, softer bed than we had ever had before. The effect on my life was amazing, as I’ve written about before. In 2011, my brother Mark unexpectedly died of an aortic aneurysm. Doctors recommended that I and my remaining brothers get checked out, in case the condition was genetic. So I went off to the doctor for an ultrasound. It turns out that I did not have an aneurysm, but they detected a slightly enlarged liver. This turned out to be the early stages of Non-Alcoholic Fatty Liver Disease. My gastroenterologist recommended losing weight and, with the assistance of the new bed, I managed to drop down to around 350lbs. Unfortunately, this wasn’t really enough, and my doctor recommended bariatric surgery. I was not very inclined to give up eating; plus, bariatric surgery was, at that time, considered “experimental” and thus was not covered by insurance. That changed in 2014, when my employer added bariatric surgery to their list of covered treatments. Finally, in December 2014, I underwent a sleeve gastrectomy; in this procedure, about 80% of my stomach was removed. There are several different types of bariatric (weight-loss) surgery. The first kind (popularized by Al Roker on NBC’s “Today” show) was the gastric bypass. This involves removing the stomach almost entirely, and requires significant changes in diet and lifestyle for the rest of your life. The lap band is another surgery where they apply an adjustable band around the stomach to artificially reduce it’s size. It has a bad track record of side effects (it’s prone to infection, for example) and, once it’s removed, your stomach returns to its original size. The gastric sleeve, on the other hand, removes a large part of your stomach, but leaves a small “sleeve” of it behind. Because your stomach is still there and functioning, you can still take oral medication, and you can pretty much eat anything, though you can’t consume more than about 4-5 ounces of anything at a time. Since December 2014 (when I weighed 360 lbs), I’ve lost a bit more than 100 lbs; last week, my weight was 254 lbs (fully clothed; at home, I typically don’t wear clothes when weighing in). Coupled with a move to Seattle, I’ve been walking regularly, going to the gym, and working out at home with kettlebells. Within a month after the surgery, I stopped taking high blood pressure medication and the cholesterol medications I’ve been on for years. I still use a CPAP for sleep apnea (according to the doctor, my apnea is mostly caused by a generic malformation of my palate, and not necessarily by my weight, though the obesity didn’t help matters). The surgery sometimes causes frustrations. I can’t, for example, drink anything immediately after eating (that tends to make the food expand and lead to vomiting), so no more bagel+coffee. I have to wait an hour or so after eating before I can drink anything. Because I can’t eat enough, I will have to take substantial vitamins for the rest of my life. I need to keep my protein up, so I usually have a protein shake for breakfast (my target is 85 grams of protein per day). But I can have a hamburger, even if I can’t have a coke to go with it. I’ve also developed an occasional aversion to eggs, which is somewhat frustrating, too. I’m prone to cheating (such as grabbing some caramel candies in the evening) which certainly makes the weight loss go slower than it would otherwise. I tell this story so that it will be documented. I’m not trying to prove anything to anyone, or recommend a particular course of action. 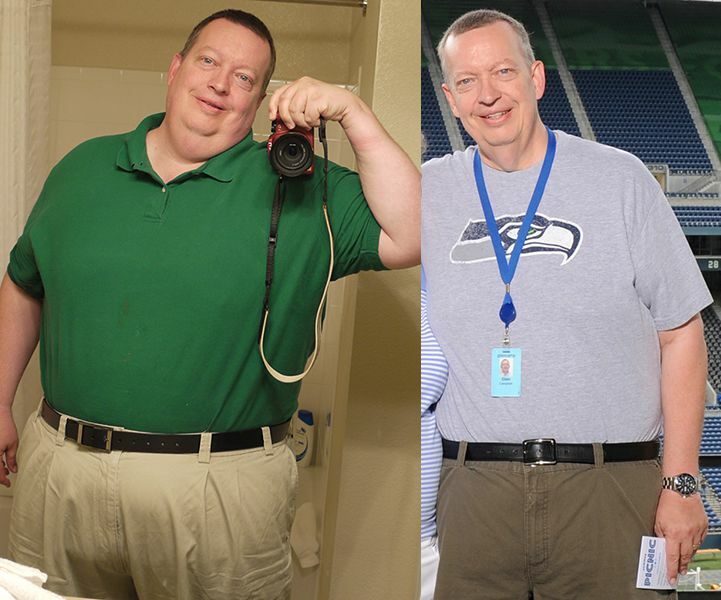 If you can lose weight without surgery, that’s probably a far better course to take if you can do it (and I’m supremely proud of my double-first cousin Jim, who managed to do just that). I am looking forward to getting back on a bicycle soon, however. I actually rode against Greg Lemond in a race in Houston when he was an up-and-coming youth cycling star. I’m pretty sure I finished behind him.